Today I finally got a chance to play with the Nokia N8. I got to use prototype hardware (still labeled C0) running early software (not even pre-release). In short, I’m definitely impressed. But I’m still concerned that the N8 will not be able to compete with iOS and Android devices when it’s launched later this summer. Let’s get one thing out of the way: the hardware is fantastic. There’s absolutely no doubt that Nokia knows how to build top-spec phones, and when it wants to, top-quality hardware. The N8, even in prototype form, showcases the best fit, finish, and materials of any Nseries device to date. The device is slim and light yet solid. The body and most buttons/covers are made of machined and anodized aluminum – only the plastic endcaps look and feel out of place. The glass capacitive OLED display is beautiful and responsive. The features are impressive – 12 MP HD camera, penta-band 3G (including AWS for T-Mobile USA), WiFi b/g/n, HDMI output, USB On-The-Go! The only N8 available for me to handle was the green one, which is not a particularly flattering color for this phone. The blue version I saw looked more attractive. Unfortunately, my time with the software was pretty limited, but what I saw surprised me by being fast and slick. It’s clear that the user interface makes extensive use of hardware acceleration and that the user experience is a significant improvement over S60v5. I was only able to test the camera indoors, and in poor conditions, but I’m extremely pleased with the results: the N8 outperformed my point-and-shoot camera, with less noise and more detail. In terms of HD video recording, the N8 promises 720p at a consistent 25 fps, and I was able to confirm this claim after some brief testing. And the icing on the cake? The shutter button feels wonderful. Fantastic hardware, promising software, and an unrivaled camera – that sums up the Nokia N8 at this point in time. Still, I’d prefer to see MeeGo on this device. Still craving more? Here’s another preview. Thanks to Nokia Blogger Relations for inviting me, and to Dolby for hosting the event. Tnkgrl, can you help me by putting me in contact with someone from Nokia Blogger Relations? Didn’t know they still had that going. tnkgrl, i am like you, a long-time s60 devotee. can you bottom line it–is this a device i would be happy with or disappointed with if purchased this 3rd Q 2010? 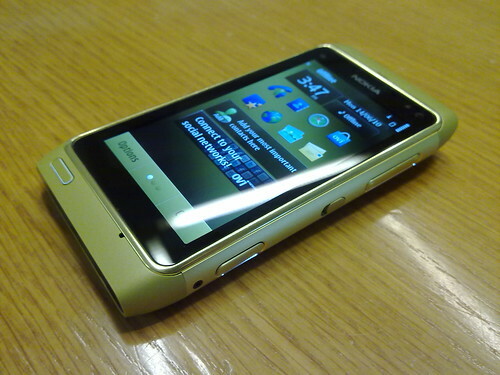 put aside any “symbian is old/high learning curve” arguments and as just an s60 user to s60 user, would you recommend it? Ask me again once it’s out and I’ve used it for a while. It looks good so far, but so did the N97 prototype I played with months before launch, and look how that turned out. The reason that profiles didn’t show up might be because, I dunno, you didn’t press the profile button. Its the one next to the clock not above it. The “offline” above the clock is for the network providers name. Yes, I made a mistake. Frankly, I didn’t have much time to form an opinion about the software – only time will tell. I was impressed with the hardware, and I’m looking forward to the final product.